Just above Sveti Stefan there is location called Blizikuce with the impressive panoramic view towards the sea. Its location is open to the seafront with favourable geo-morphological features and it is going to be developed in one of the most beautiful. A complex “Tsar’s Village” consists of 36 exclusive villas. Located on the top of the hill, just above the prestigious location of peninsula of Saint Stefan, a village offers an impressive panoramic view towards the sea, city of Budva, Becici and other picturesque parts of the Montenegrian coast. 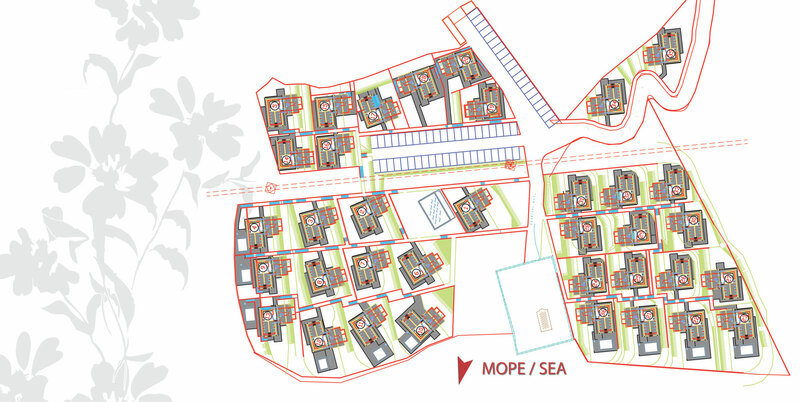 Each villa with the area 164m2 is a unit in itself, with its own yard which comprises the area of about 60m2 of garden. Villas are designed in a traditional Mediterranean style, with contemporary technological solutions, combining stone and wood, large open-spaces, providing a lot of sunlight inside and creating in such a way a unique fusion between interior and exterior. Terraces and gardens of each villa open a magnificent view toward the Adriatic sea, Saint Stefan and Island of Saint Marco. Beautiful nature, surrounding the complex, as well as unique views from the location, will permit to it’s users to pass unforgettable vacations in one of the most exclusive zones in the Montenegrin Coast. The entire complex is secured and gated, along with the main parking plot.